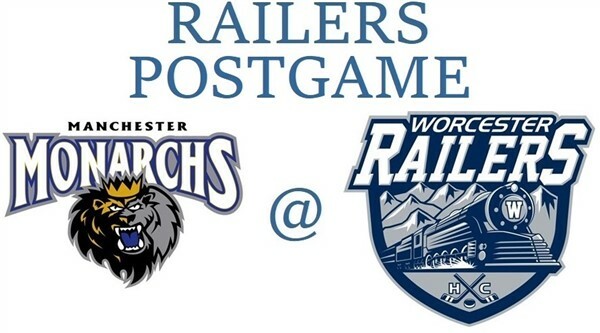 The Worcester Railers took on the Manchester Monarchs Sunday afternoon at the DCU Center in what was another in a long line of “must win” games as the playoff chase in the ECHL’s North Division comes down to the wire. Earlier in the day the Railers made an announcement that surprised many, saying that Worcester Head Coach Jamie Russell had decided to go with Mitch Gillam in goal against the Monarchs despite Gillam playing his third game in 44 hours. As it turns out it didn’t matter who Russell put in net as Worcester once again stumbled out of the gate and dug themselves a huge hole in the opening twenty minutes. Manchester logged the first ten shots of the game, and had a 2-0 lead before the Railers got one on net that Monarchs netminder Charles Williams had to make a save on. On their second shot of the game Manchester scored their first of the game when Pierre-Luc Mercier flipped the puck along the ice toward the Worcester goal. The puck knuckled past two Railers players to Kevin Dufour in front, and he banged it home at 1:56. Nic Pierog made it 2-0 Monarchs on their seventh shot of the game with a shorthanded breakaway goal. It took until 10:56 of the opening period for the Railers to get their first shot on goal, and then they had the next seven but couldn’t light the lamp. Matheson Iacopelli gave Manchester a 3-0 lead when he beat Gillam from about 40-feet out with an absolute blast that came out of the net almost as fast as it went in. Pierog grabbed his second of the game at 16:27 when Mercier fired one wide off the end boards that rebounded right to Pierog’s stick. He backhanded it between Gillam and the near post to make it 4-0. Despite Gillam essentially playing against Manchester by himself to that point Russell pulled Gillam from the game and Blake Wojtala took to the net. At 5:04 of the second period Ryan MacKinnon got the Railers on the board when Bo Brauer threw a pass from the right wind side that sent MacKinnon in on Williams. MacKinnon’s shot slid under Williams and in to stop the bleeding. Pierog would reopen the wound at 12:42 when he banged a rebound of a Dufour shot to make it 5-1. That goal turned out to be bigger than anyone could have possibly imagined at the time. Less than two minutes later Worcester scored again, this time when Josh Holmstrom outhustled Manchester defenseman Stepan Falkovsky to a loose puck and drove toward the net. Matty Gaudreau, racing toward the net, and was able to tip home Holmstrom’s centering feed at 14:24. Just as Gaudreau scored Falkovsky drove him hard into the end boards and Gaudreau was down for a short while. For some inexplicable reason Referee Liam Sewell made no call despite it being a clear hit from behind and to the head area, never mind it being well after the goal was scored. With under a minute to go in the second period Barry Almeida made it a two goal game when he scored on an odd man rush. Tyler Barnes broke into the Monarchs zone on the right side with Ryan Hitchcock streaking down the center and Almeida on the left. As Hitchcock went to the net Almeida slowed up to make himself the trailer in the play. Barnes found him high in the slot and Almeida’s shot beat Williams to the stick side at 19:27 to cut the Manchester lead to 5-3. The goal was Almeida’s 109th point with the Railers, putting him in 20th place all-time in Worcester pro hockey history. David Quenneville got the Railers fans to their feet just 3:04 into the third period when he grabbed a loose puck at the right wing point and fired it on net. The shot seemed to surprised Williams, who looked disgusted with himself when the goal horn sounded to make it 5-4 Manchester. Holmstrom had the primary assist on the play, with defenseman Spencer Trapp earning his first pro point with the secondary helper. But despite the fans being as loud as they had been all night and Worcester playing with a pep in their step that had been missing for most of the game, that was as close as they’d get as both Chris Carlisle and Pierog would score empty netters for the 7-4 final. The loss drops the Railers to fifth place in the North Division, but they still control their own playoff destiny. They next play Friday night against Maine at the DCU Center. Scratches for the Railers were Evan Buitenhuis (Day to day/lower), Ivan Chukarov, Kyle McKenzie (Out for season/shoulder), Charley Michalowski, Tommy Panico (Out for season/hand), Matt Schmalz, and Alex Vainer (14-day IR/upper). Blake Wojtala started the game as the back-up goaltender and entered the game at 16:27 of the first. Defenseman Robert Powers made some Worcester pro hockey history in the game, and it wasn’t the good kind. Powers finished the contest with a (-5) rating, which ties Nick Petrecki for the worst showing in a single game. It wasn’t a great night for Barry Almeida either, who finished at (-4). Blake Wojtala fell victim to a hockey scoring rule, getting the loss for the game despite just giving up one goal in the contest. In hockey the winning and losing goaltender is determined by who is on the ice when the winning goal was scored. So despite entering the game down 4-0 Wojtala gets the loss because the fifth Manchester goal ended up being the game winner. On this day, March 18th, in Worcester hockey history…in 2007 the WorSharks fell behind to the Portland Pirates, but two goals by Tom Cavanagh sandwiched around a Mathieu Darche strike gave Worcester the 3-2 win. Lukas Kaspar assisted on both WorSharks third period goals that tied the game and gave them the lead. Thomas Greiss made 22 saves for the win…in 2012 the WorSharks scored four second period goals and would go on to defeat the Bridgeport Sound Tigers. Brandon Mashinter, James Livingston, Tony Lucia, and Sebastian Stalberg all connected in the middle frame, and Tim Kennedy added an empty net goal for the 5-2 final. Harri Sateri made 33 saves in the game, which saw 86 penalty minutes called. WorSharks captain Mike Moore and Micheal Haley, who would go on to play for Worcester in 2014-15, fought twice and were both ejected…in 2018 the Railers got an unassisted game winner by Jeff Kubiak and a shorthanded insurance goal by Woody Hudson to defeat the Utah Grizzlies 4-2. Ryan MacKinnon and Ben Masella both had tying goals as Worcester fell behind twice in the contest. Mitch Gillam made 19 saves in the victory. The 210Sports Player of the Game is Josh Holmstrom. 1st Period-1, Manchester, Dufour 24 (Mercier), 1:56. 2, Manchester, Pierog 28 (Falkovsky), 8:28 (SH). 3, Manchester, Iacopelli 5 (Falkovsky, Miromanov), 15:46. 4, Manchester, Pierog 29 (Mercier, Miller), 16:27. Penalties-Brauer Wor (slashing), 5:35; Iacopelli Man (interference), 7:02; Rymsha Man (tripping), 18:54. 2nd Period-5, Worcester, MacKinnon 6 (Brauer), 5:04 (PP). 6, Manchester, Pierog 30 (Dufour, Cameranesi), 12:42. 7, Worcester, Gaudreau 11 (Holmstrom, Quenneville), 14:24. 8, Worcester, Almeida 22 (Barnes, Hitchcock), 19:27. Penalties-Mercier Man (tripping), 3:18; Cameranesi Man (cross-checking), 8:25; Turcotte Wor (high-sticking), 10:39. Shots on Goal-Manchester 14-8-8-30. Worcester 10-11-5-26. Power Play Opportunities-Manchester 0 / 2; Worcester 1 / 4. Goalies-Manchester, Williams 20-11-1-2 (26 shots-22 saves). Worcester, Gillam 19-13-1-3 (13 shots-9 saves); Wojtala 1-2-0-0 (15 shots-14 saves). Linesmen-Shane Kanaly (39), Kyle Richetelle (73).